The State of Vermont has been our client for decades, and we have built numerous public web sites and internal portals for different departments. All based on SharePoint of course! About a decade ago, Lee Susskin, court secretary/administrator, awarded us an RFP to build the judiciary a new public site. It was mentioned that there was an annual contest for top judiciary sites. We took the challenge to build them a site and organize all their information and also to submit it and win top 10. 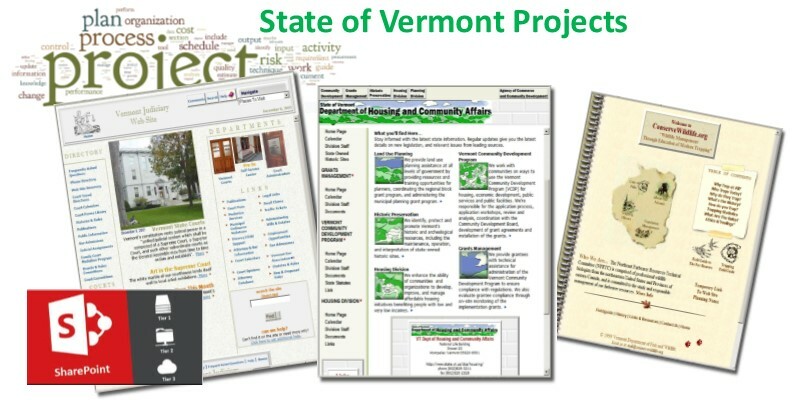 Since they never really had had a site before we were starting from scratch, and we had to do a lot of brainstorming to find a motif to communicate who and what they were, and of course also make sure that all information that a citizen of Vermont would need would just be a click away. We built them a 2007 SharePoint site that was heavily influenced by pictures of courthouses and wooden motifs. We created organization schema for a great deal of information by organizing it into subsites for logical purposes. We had a thriving relationship with the judiciary, and, as it turned out, we were hosting it, and this continued for many years and we built an intranet called "JustUsNet, and performed some other process automation projects for them. We even went through a knowledge transfer session to assist with migrating it to 2010, . We won a top 10 judicial web site award that year. FLIMS was logically two main databases that track 305 evidence submission forms. The first logical section is tracking 305 forms and insuring that duplicate case numbers and log numbers are not used. The second section deals with the recording of laboratory analysis data by the department. The connection to these two logical sections is made by the analyst who reads the 305 form and then uses judgment to record evidence and determines the required tests for that particular evidence submission. FLIMS goal was assist the lab with record keeping automation. FLIMS tracked the flow of 305 forms and it has conveniences of accessory record keeping for travel expenses, lab vendors, and phone messages. FLIMS also tracked the amount of testing work done by department to be used for administrative purposes to track monthly work loads and other lab statistics. We want to help you get the most out of SharePoint so contact us today! One of the easiest ways to get to know us is with a SharePoint health check where we can quickly review your current configuration and recommend how to better align SharePoint with your business goals.